There has been a lot of talk and some fuss over the "Blood Moon" phenomenon that astrologists and prophecy experts say will occur next spring and again the year after. Is it a sign on parallel with the Star of Bethlehem that led the Magi over the desert to the place where Jesus was born? Is it a sign of events that trigger the coming Tribulation or even the Rapture? There are differing opinions. Personally I believe these Blood Moons are definitely signs of our times. Enough has been written discussing the themes above that I could not add any help. However, what I would like to do is to look at the Blood Moon of Joel two. The mention is in Joel 2:31, "The sun shall be turned into darkness, And the moon into blood, Before the coming of the great and awesome day of the LORD." What Blood Moon is Joel talking about? Let's walk through the passages and consider what Joel states. As we get into the passage students of the New Testament will note that the Apostle Peter also speaks of this event in Acts 2 during his awesome Pentecost sermon! (21) Fear not, O land; Be glad and rejoice, For the LORD has done marvelous things! (22) Do not be afraid, you beasts of the field; For the open pastures are springing up, And the tree bears its fruit; The fig tree and the vine yield their strength. Again we see the Fig Tree coming into its own. The time for ripe figs has come. The fields are in bloom. Beulah land (Is. 62:4) has a groom as the people begin to settle into her midst. This passage has been in preparation for final Millennial fulfillment for nearly 65 years and counting. (23) Be glad then, you children of Zion, And rejoice in the LORD your God; For He has given you the former rain faithfully, And He will cause the rain to come down for you— The former rain, And the latter rain in the first month. All those complaints that God has rejected Israel and that He no longer has a plan for her are quieted in the midst of her resurrection to nationhood. Just as He was faithful to her--even in times of long-suffering and discipline--He will not reject her forever. The latter rains will come. This passage implies us that there is a space of preparation--a time of setting up the foundations--that must take place before the Lord appears in Glory and they mourn for He whom they have pierced, (Zech. 12:10). In the Garden of Eden God prepared a perfect Utopia before He put mankind into it. Once there, they cared for the garden and had communion with God. A time of preparation will precede, Peter's "Time of Restoration." (Acts 3:21) Once all things are in place then the end shall come and usher in the beauty of Millennial life. "whom heaven must receive until the times of restoration of all things, which God has spoken by the mouth of all His holy prophets since the world began." We know that God is currently setting up and positioning His land to produce a people who will turn in sincerity to Jesus Christ as Lord and Savior--the Redeemer of the world. In this they are told, as we, to "Be Glad" for what God has promised will come to pass. (24) The threshing floors shall be full of wheat, And the vats shall overflow with new wine and oil. This passage is an analogy of what will come to pass in that Day when the Lord brings all believers into His grace together under the banner of Christ. It is a picture of the fullest of blessing and that meant for all who will believe. It's ultimate fulfillment is during the Millennial age. (25) "So I will restore to you the years that the swarming locust has eaten, The crawling locust, The consuming locust, And the chewing locust, My great army which I sent among you. Times can be tough for every person who has to endure loss, discipline, and chastisement for our obstinance, stubbornness, and insubordination to God. But in the end we learn that through the pain we have become ready for faithful service. God promises to restore all that was taken away. Like the gladness of a mother who went through the labor of bringing life into the world, when the new child arrives the pain fades away (John 16:21). God is the master of refocusing our focus. (26) You shall eat in plenty and be satisfied, And praise the name of the LORD your God, Who has dealt wondrously with you; And My people shall never be put to shame. Something permanent is coming. So permanent that God says "His people will NEVER be put to shame." Just as He has dealt wondrously with them in the past so shall He do so again. Contentment and plenty will be the rule of that day. (27) Then you shall know that I am in the midst of Israel: I am the LORD your God and there is no other. My people shall never be put to shame. So awesome will be the provision and the wondrous works of God that it could only be explained as miraculously supernatural. If man was able to reproduce it would not turn anyone to God His maker. No one would proclaim that the Lord is God and there is no other. We must look beyond the woeful results of man's devising and be prepared to rejoice in the awesome works of God. This time in HIS -STORY will be so much greater than anything mankind could ever accomplish. (28) "And it shall come to pass afterward That I will pour out My Spirit on all flesh; Your sons and your daughters shall prophesy, Your old men shall dream dreams, Your young men shall see visions. Here we have a passage that begins with the enigmatic "And it shall come to pass afterward..." The Hebrew for "afterward- HEB. "ahar" seems to mean, in English, after some event such as what is described above, the events of vs. 28 would follow. But that would mean that Millennial blessing would precede the pouring out of God's Spirit. That is not so. This phrase is enigmatic because Peter does not use it in that way in Acts 2:16-21. He states "AND IT SHALL COME TO PASS IN THE LAST DAYS, SAYS GOD," replacing "afterward" with "In the Last Days." 'AND IT SHALL COME TO PASS IN THE LAST DAYS, SAYS GOD, THAT I WILL POUR OUT OF MY SPIRIT ON ALL FLESH; YOUR SONS AND YOUR DAUGHTERS SHALL PROPHESY, YOUR YOUNG MEN SHALL SEE VISIONS, YOUR OLD MEN SHALL DREAM DREAMS. I WILL SHOW WONDERS IN HEAVEN ABOVE AND SIGNS IN THE EARTH BENEATH: BLOOD AND FIRE AND VAPOR OF SMOKE. (29) And also on My menservants and on My maidservants I will pour out My Spirit in those days. (30) "And I will show wonders in the heavens and in the earth: Blood and fire and pillars of smoke. In vs. 30 we see how this outpouring will culminate into the Restoration of all things after final judgment against disobedience is poured out. Those days are the days of vengeance. This restoration occurs at the end of the age once Israel has been brought into the bond of the covenant through Christ our Lord (Ez. 20:37). So what is presented in Joel and pointed to by Peter is an action that will occur prior to the Millennial blessings. This time will begin on Pentecost and end when Christ destroys the armies of Antichrist and brings in the restoration of all believers together in the Kingdom of the Millennium. I personally believe this will be actuated at the Wedding feast where people from all walks of life who have turned to Christ for salvation, including OT believers whose faith looked ahead to God’s One vicarious sacrifice, that of Jesus our Lord, is celebrated in the Kingdom. Some feel the Wedding and the feast are in heaven. But I believe through biblical research the wedding occurs in heaven and the feast on earth. (31) The sun shall be turned into darkness, And the moon into blood, Before the coming of the great and awesome day of the LORD. 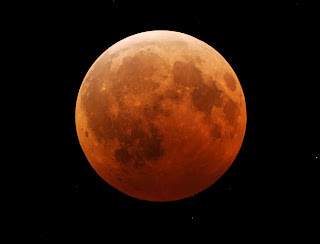 This Blood Red moon seems to occur during the tribulation if the great and awesome day of the LORD is synonymous with the final 3 ½ year trib. (32) And it shall come to pass that whoever calls on the name of the LORD Shall be saved. For in Mount Zion and in Jerusalem there shall be deliverance, As the LORD has said, among the remnant whom the LORD calls. Notice the final verse narrows down the recipients of this salvation that come through Jesus as the “remnant” of those the Lord calls. The Holy Spirit opens the eyes of a select few people among those living in the very final stages of the Tribulation to the invitation of Salvation first delivered by the Apostles on the day of Pentecost. Joel goes full circle. In Joel 2:23, we have the promise of "the teacher of righteousness" (marginal reading) as in 2 Kings 17:27; Job 36:22; Prov. 5:13; Is. 9:15; Is. 30:20; Hab. 2:18. So the order here seems to be (1) Christ comes, "the teacher of righteousness," (2) come Pentecost and the Holy Spirit, (3) comes the destruction of Jerusalem which is the climax of the "day of the Lord" on the Jewish people. In Joel 2:28-32 we have the first distinct prediction of the advent of the Holy Spirit, fulfilled on the day of Pentecost, following which is the far distant judgment day, adumbrated by the destruction of Jerusalem from which destruction escapes a remnant who are specially called of Jehovah (see Is. 1:9; and Rom. 11:5). Does this help with the Conundrum of the Blood Moons? Maybe, but maybe Joel speaks of a different time that astrology cannot predict when the Moon shall be turned into blood. In any case I believe the fact that is going to happen in the spring over the next two years is a significant sign. God is definitely at work.